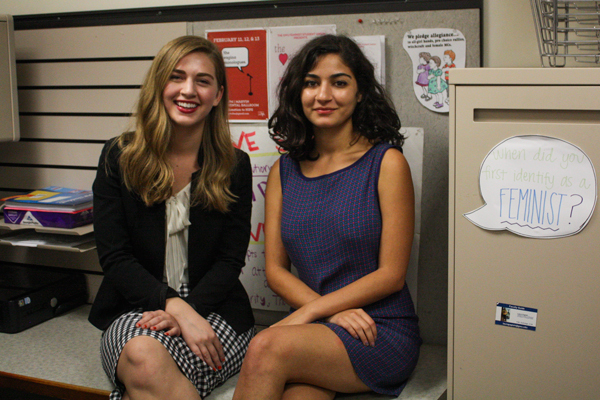 Feminist Student Union Co-Presidents Lauren Courtney and Negar Esfandiari are part of a group of students trained on effective protest methods called the Action Corps. The Feminist Student Union is creating a subgroup focused on protests in the D.C. area. The group, called Action Corps, will be staffed by student volunteers who are trained in effective protest methods and will send out alerts to a subscribed group of FSU members when protests break out in the city. FSU leaders say they want to create a channel through which students on campus can remain informed and involved with feminist issues in the area. The group’s leaders said volunteers will go through a student-led training about nonviolent demonstrations and sign up to receive phone alerts about D.C. protests related to reproductive rights, domestic violence, police brutality, environmental issues and family leave policies. Lauren Courtney, the co-president of FSU and the organizer of the program, said the corps will help students become involved in larger-scale activism. “One of the ways that I think we really build strong relationships with people of all different levels of understanding is through direct action,” Courtney said. Courtney said the corps builds on the momentum from the student organization’s protests last year: The group protested for abortion rights outside the Supreme Court while the court decided on a ruling that found Texas cannot place restrictions on abortion services that create undue burden for women. “We had over 100 people come with us, which is a huge turnout, and we saw people there who had never come to an FSU meeting before,” Courtney said. Students joining the group will attend a special training session Oct. 1 run by a professional Student Global Aids Campaign organizer. The training will focus on skills that apply to advocacy, including how to conduct legislative visits, lobby Congress and write letters to the editor, Courtney said. Students will also have to sign a pledge to nonviolent resistance that Courtney wrote, she said. Carley Berlin, the deputy director of communications for the GW College Democrats, said students should get to interact directly with politics, which FSU’s subgroup is helping them do. “We believe that it is imperative to increase the female presence in political dialogue,” Berlin said. Emily Stephens, the co-president of Hoyas for Choice at Georgetown University, said although her university does not have an equivalent to the corps, she thinks FSU’s group will help members be more involved with activism. Stephens added that Hoyas for Choice stay aware about local rallies in the D.C. area by keeping in contact with several local reproductive justice organizations. “We certainly support the prospect of college students doing more to engage with the community they live in, and the Action Corps sounds like an effective way to do that,” Stephens said.